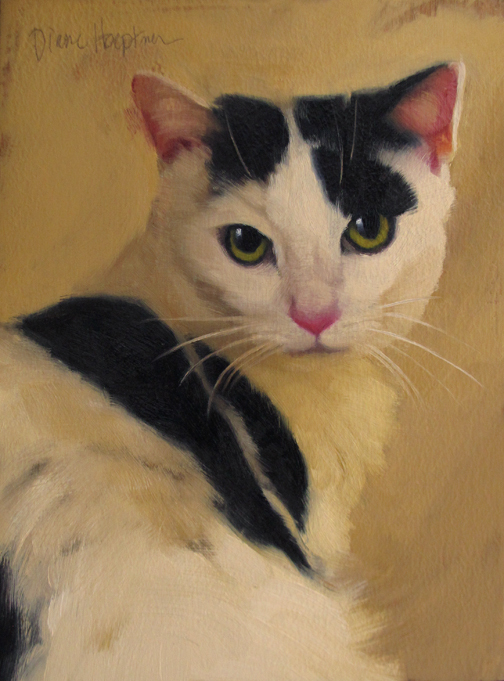 Diane Hoeptner: Spot a new cat painting, also I turned 50. Oh the horror? Spot a new cat painting, also I turned 50. Oh the horror? Last week I turned 50. (Gulp.) ...while I wouldn't call my current state of affairs a mid life crisis, it is a mid life stop, pause and wonder What-the-H??! I thought I'd have children by now. Also by now, I'd spend my time travelling the world, throwing fabulous dinner parties and swimming with dolphins. Marc Maron did an interesting interview with Judd Apatow last week. They talked about how parenthood is not unlike experiencing "seasons." The parenthood ship has sailed for me but I love the comparison. Parents watch their children move through phases and they know in no uncertain terms, time is passing. I remember what a revelation moving back home to Ohio was (after almost 20 years in L.A.) Time indeed started to FLY with the four seasons spring, summer, fall and winter as daily reminders. It still is, though it seems entirely impossible that I am 50. It's taking a minute to process. Happy Birthday Diane! So interesting how time moves on and how we use it to mark accomplishments. You are a beautiful artist! Your work makes me smile and I am so excited when I see your blog post in my email! Happy birthday! As we get older, the possibilities don't narrow, they just shift a little bit. Best wishes from Maggie. There is the saying, " 50 is daunting , but what's the alternative? " Indeed. And last year I met someone who felt old turning 21 ! lol The interesting thing about getting older and having to leave our ideas about ourselves is new ones can then come in. For sure ALL of life is a series of seasons - yours must be primarily spring because it's perennially blossoming! Happy Birthday! At 50 I felt like I was not where I thought I should be. Had 3 boys, a nice home, and then a marriage that ended. I burst into tears at a surprise party. But I was surrounded with friends and family and gave my situation a thought too! With all their support in reminding me about where I was on that day, I felt much better. Mom turned 90 this year and too is wondering where the years have gone and 90 made her pause. At 70 I am happy with myself and where I am. It sure is not doing what I thought, but it is OKay. I am independent, working full time (not in art, but with books in a university music library....books my 2nd love), I do have an art studio that I get to use more and more. To watch time move on my oldest grandson just finished his Bachelor Degree from Ball State IN. But it is a good life. Ponder your 50th and enjoy every moment you have. Love your work. A little teary. Thank you, Sherry for commenting. You so beautifully illustrated the kind of "regret" and bittersweetness that time's passing brings on. (And that the amount of time and the amount of regret are distinctly "mileage may vary" if that makes any sense....) I am incredibly grateful that my work is satisfying. I feel somewhat self conscious for even posting about turning 50, but in my mind everything is so inter-connected the art, my feelings about my age, my ability to do what I do. ....and once I stop it already with the self absorbed introspection, I can get back to life as usual. (A life I am generally and sometimes enthusiastically "OKay" with) Admitting my befuddlement makes that easier. Hearing from you guys, even more so. Thank you, Dorothy and Suzy! Happy birthday Diane. 50 is great! I was there 13 years ago and my world sort of flipped because of medical issues, but it's a great time to really enjoy all the things you've learned in life and to start ticking things off the bucket list. hehe. That's when I started painting. You're miles ahead of me! It's a time of harvest and it's often overwhelming rich . It's the richness of this time that is disorientating too. Spot seems to be giving that, "What... you can't possibly be turning 50!!?? ", look as she/he turns around for a second look. Welcome to the 50's! Happy belated birthday Diane. I am really enjoying your work, you certainly have a special feeling for cats... it shows in your wonderful brush work.